The biological communities have been widely applied in the assessment of the ecological status of water bodies. In particular, diatom communities integrate the environmental effects of water chemistry, along with the physical and geomorphological characteristics of rivers and lakes. 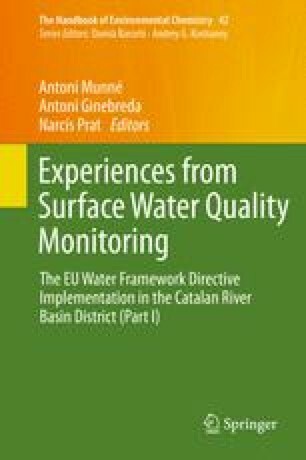 The European Water Framework Directive (WFD) included for the first time in Europe the concept of ecological status of aquatic ecosystems in water quality evaluation, based on the use of biological quality elements (BQE) in a type-specific context. During the implementation of the WFD in Catalan rivers using diatoms, 152 stream and river sites were sampled, and the applicability of existing diatom indices to monitor water quality in Catalan rivers was tested. The correspondence between the already proposed typological classifications of rivers and the biological classification was also examined. Since the bioassessment methods using diatoms needed to be comparable amongst different fluvial ecosystems in Europe, several intercalibration (IC) exercises were done throughout Mediterranean areas in Europe. The Mediterranean IC exercise faced the inconsistency between the river types and the biotic classification, the lack of real pristine sites and the existence of taxonomic discrepancies. In spite of these constraints, the Intercalibration Common Metric (ICM) consistently related with the local-used indices (IPS) in all the countries tested. However, during this process, the need of revising the river typology as well as of revisiting the fine-tuning of taxonomic identifications was clear. Putting effort in these aspects would improve the water quality assessment at the national level and would also improve the subsequent comparability amongst countries.